The 9th Annual Cooper Trooper Pumpkin Patch will be held at 530 Cool Springs Blvd., at the corner of Mallory Lane and Cool Springs Blvd. in front of Walgreens October 6th – October 31st, 2018. Unload Dates are October 6th, 13th, and 27th. If you have a group interested in volunteering to help unload the thousands of pumpkins off trucks, please email us at info@coopertrooper.org. or call Missy at 615-944-6637. The Volunteer Calendar will be posted in September, but if you are interested in having your group be involved or becoming a weekly volunteer, you can go ahead and let us know! We would love to get you plugged in. Also, we are taking new sponsors…deadline to let us know is August 1, 2018. Payment is due September 1, 2018. See the “Sponsor the Patch” information on our website for more details and to submit a form. 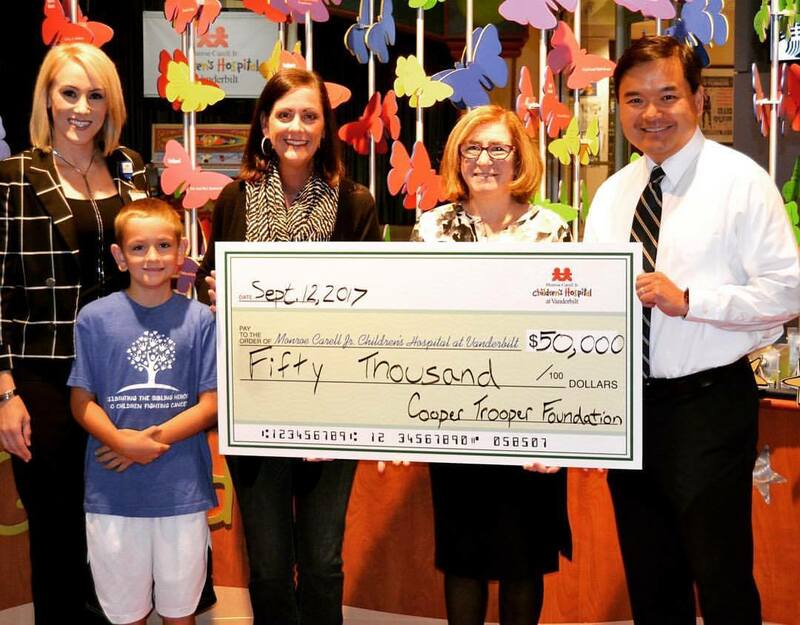 On Sept. 12, 2017, the Cooper Trooper Foundation presented our yearly check to Monroe Carell Jr. Children’s Hospital at Vanderbilt for $50,000 toward the endowed Fund for Childhood Cancer Research. 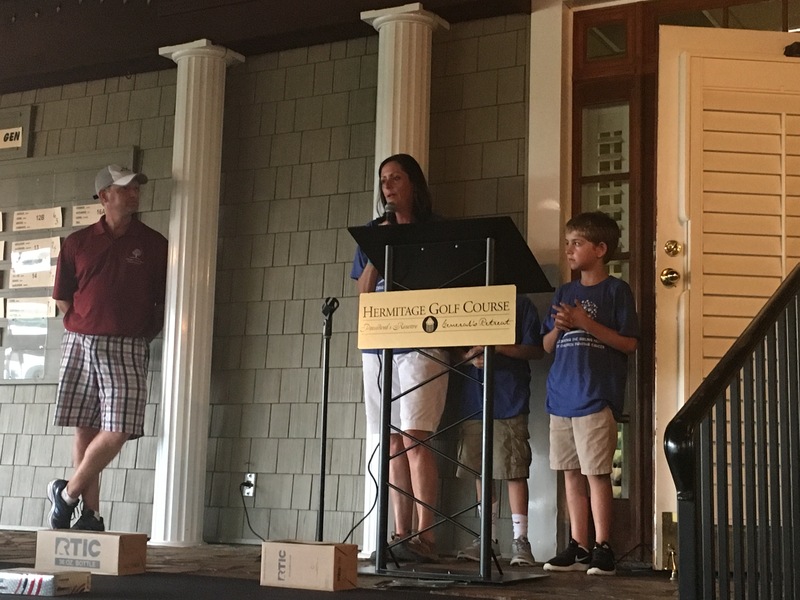 To date, Cooper Trooper Foundation has given $200,000 toward the fund, which is geared specifically toward funding research and treatment studies for childhood cancer. It is because of the success of the annual Pumpkin Patch fundraiser, that CTF is able to continue this effort and make an impact for those families who are battling childhood cancer. We are truly honored to partner with Monroe Carell Jr. Children’s Hospital at Vanderbilt in this endeavor. The 8th Annual Cooper Trooper Pumpkin Patch Fundraiser will be October 7-31st, 2017. Hours will be Sunday – Friday, 10am-7pm and Saturday 9am-8pm. The location will be the same as years past, at the corner of Cool Springs Blvd. and Mallory Lane in front of Walgreens (530 Cool Springs Blvd, Franklin, TN 37067). Stay tuned for volunteer opportunities and a calendar to sign up. We are currently accepting corporate sponsorships for the patch until Aug. 1st, 2017. For more information, email missycook@coopertrooper.org or check out the link for Sponsors under the Pumpkin Patch tab on this website! If you have a group that would like to be involved with set up, unloading pumpkins, tear down, or other group volunteer opportunities, we would love to have you…shoot us an email and let us know! On April 30th, 2017 a Crawfish Boil Fundraiser benefitted Cooper Trooper Foundation. The event featured the crawfish boil, live music, and an amazing auction. We were so honored to be a part of this event and received a check for $5000.00 from the Mary’s Trail Fund to support our mission of helping families who have been diagnosed with Childhood Cancer! Colby and Cooper even received a signed jersey from their favorite players at the event! The 2016 Pumpkin Patch was a HUGE success! It truly exceeded our wildest imagination. After a full 31 days, 5 weekends, and 3 truck unloads, during the month of October, we can say that it was our most successful year yet. Thanks to the hundreds of volunteers, sponsors, and those who purchased their pumpkins from us, Cooper Trooper Foundation raised just over $90,000! We are beyond thrilled and grateful for the impact this will have to support families who have heard these 4 words, “YOUR CHILD HAS CANCER.” Thank you again, so much, for your continued support!! 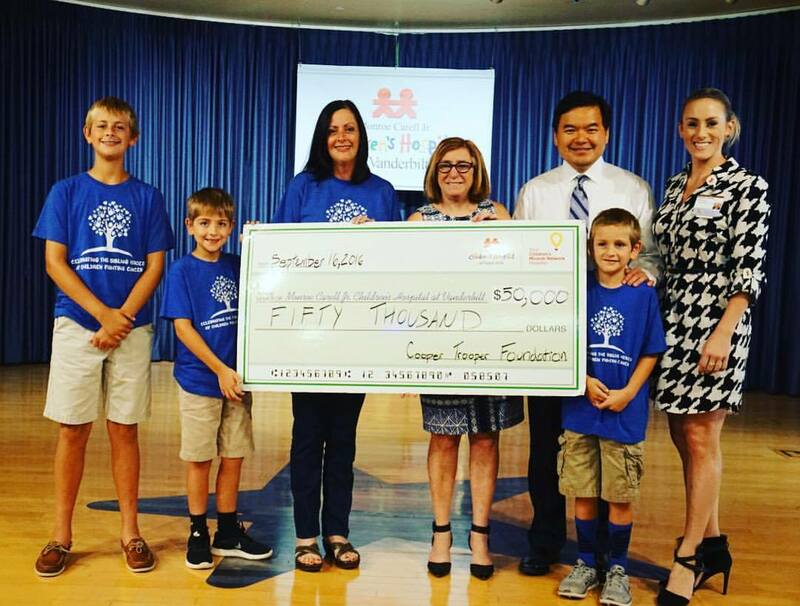 On September 16, 2016, Cooper Trooper Foundation presented a check for $50,000 to Monroe Carell Jr. Children’s Hospital at Vanderbilt toward our Cooper Trooper Foundation Fund for Pediatric Cancer Research at Children’s Hospital. To date, CTF has given a total of $150,000 to this fund for much needed research specific to childhood cancer. In large part, the Cooper Trooper Pumpkin Patch fundraiser is what allows us to make these donations and continue funding in this area. So, thank you to all who support the Pumpkin Patch and donate to CTF throughout the year! Cooper Trooper is so honored and grateful for CAT Financial’s extremely generous contribution. 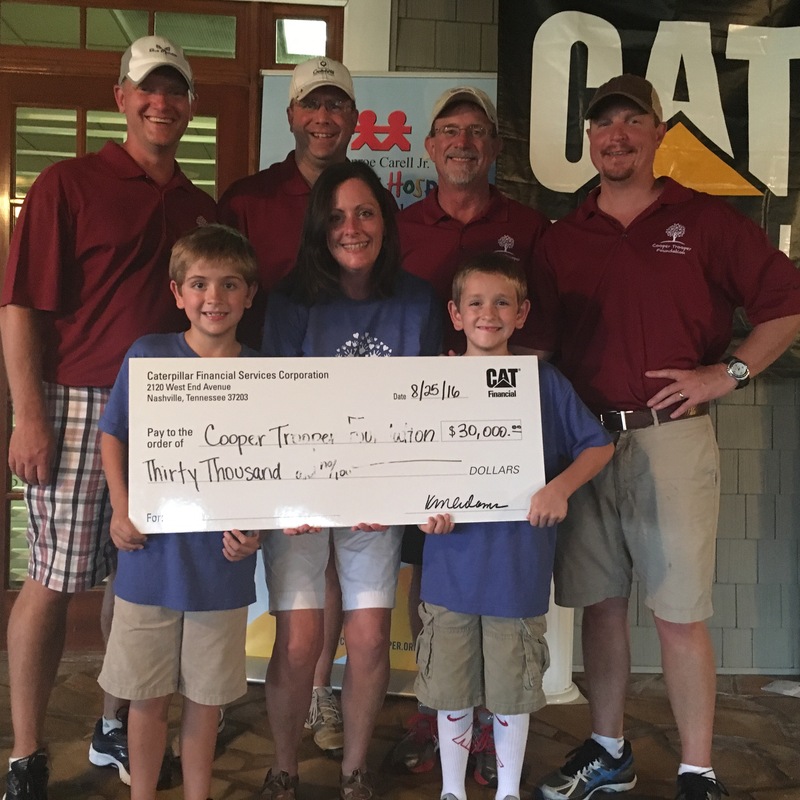 On August 25, 2016, CAT Financial held their annual golf charity event at Hermitage Golf Course. A check for $30,000.00 was presented to Cooper Trooper Foundation at the event. The day was such a fun-filled event. Golfers and CAT Financial employees even helped CTF build Courage Kits, while they waited at various holes. We are truly so thankful for the generosity shown and all the work that went into such a successful event. 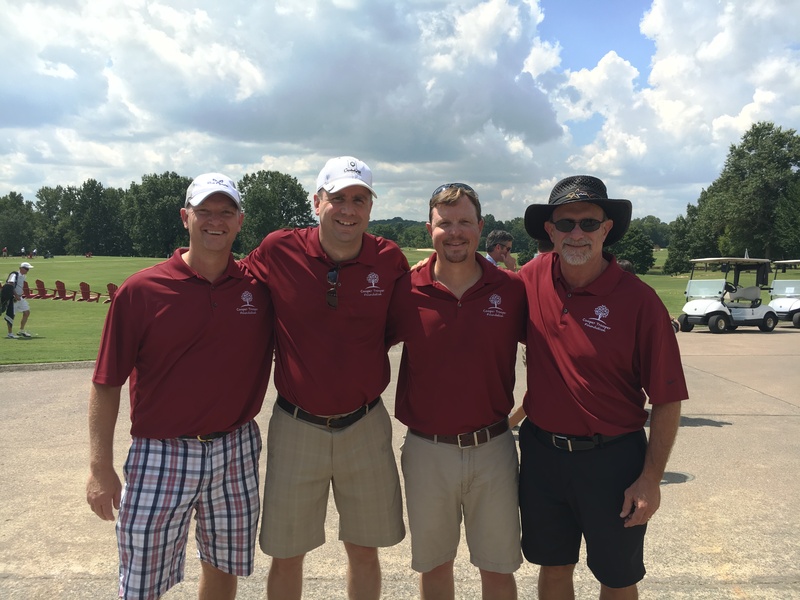 A special thank you to Josh Cook, Jeremy Westmoreland, Paul LeGuenec, and David Whetstone for representing Cooper Trooper at the tournament! Thank you to those who participated in the Big Payback on May 3rd! Despite a massive technical problem with the company hosting the server, which resulted in the campaign ending early in the day…we raised over $2000. While we are disappointed that the day did not go as planned, we are truly thankful for the generosity of those who were able to go online and donate, for those who kept trying, and for those who helped spread the word. These things are out of our control, and unfortunately the error by those running the online services (not Community Foundation of Middle TN), cost us some donations. We are going to choose to be grateful for the donations received and not focus on the loss. So, thank you so much for continuing to support CTF and our efforts to help families fighting childhood cancer! The Cooper Trooper Foundation was honored to present $25,000 to Monroe Carell Jr. Children’s Hospital at Vanderbilt for pediatric cancer research! To date, CTF has given $100,000 to the Cooper Trooper Foundation Fund for Pediatric Cancer Research at Children’s Hospital. We know that only 4% of dollars from our nation’s budget is spent on childhood cancer research, specifically, despite the fact that this disease is the #1 disease killer of America’s children. This is WHY we support this effort, in hopes that one day a cure will be found. THANK YOU to all who continue to support us so that we can diligently support the fight against childhood cancer!